USB FatBear is a flash drive storage device for your archives, back-up, documents, i-tunes, movies, music, and photos. It's powered by the computer's USB port: so doesn't need feeding. It's cute, useful, and only 62mm high, top to tail. 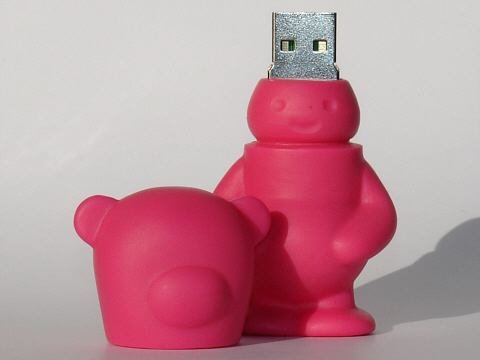 USB FatBear has a soft plastic body in pink, blue, or yellow, with a removable head and a tiny USB flash-memory module. It needs no installation, uses no batteries, and works with any modern PC or MAC.